1) Thoughts on the Proposed Change of Currency, and Other Late Alterations, as they Affect, or Are Intended to Affect, the Kingdom of Scotland. Edinburgh: Printed by James Ballantyne and Company. For William Blackwood, Edinburgh. 1826. 2) A Second Letter to the Editor of the Edinburgh Weekly Journal, from Malachi Malagrowther, Esq. 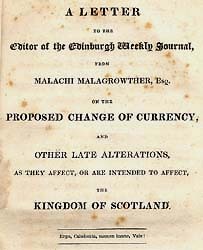 on the Proposed Change of Currency, and Other Late Alterations, as they Affect, or Are Intended to Affect, the Kingdom of Scotland. Edinburgh: Printed by James Ballantyne and Company, for William Blackwood, Edinburgh. 1826. 3) A Third Letter to the Editor of the Edinburgh Weekly Journal, from Malachi Malagrowther, Esq. on the Proposed Change of Currency, and Other Late Alterations, as they Affect, or Are Intended to Affect, the Kingdom of Scotland. Edinburgh: Printed by James Ballantyne and Company, for William Blackwood, Edinburgh: and T. Cadell, Strand, London. 1826. In 1826, after a series of bank failures in England, the British government proposed a drastic reform of the banking system. It was decided to forbid private banks from issuing banknotes smaller than £5, as many struggling English banks had proved unable to redeem them. Like many of his countrymen, Scott feared this measure would be disastrous for Scotland where the scarcity of gold and silver made small notes the principal medium of circulation. It would strike at the prosperity of Scotland's banks which depended on their ability to create credit. The inevitable result would be a drop in prices accompanied by economic depression. Scott launched a caustic attack on the Government proposal in three letters, published in the Edinburgh Weekly Journal (February 22, March 1, and March 8, 1826) and subsequently in pamphlet-form. He adopted the transparent persona of Malachi Malagrowther, purportedly a descendent of Sir Mungo Malagrowther, the malcontented courtier in The Fortunes of Nigel. He was also following a literary precedent, Jonathan Swift's Drapier's Letters, in which, posing as a linen-draper, the author had appealed to Irish national sentiment in a successful campaign to prevent the coinage of copper currency for circulation in Ireland. The first letter noted that Scotland had known few bank failures in the previous fifty years and that the economy had flourished under the existing system. Industry and agriculture had progressed rapidly. Paper currency, so distrusted in England, had made banking services available to remote communities and facilitated the transmission of capital in a sparsely populated country. No Scottish bank had failed during the current crisis, so it would be unjust to punish Scottish banks for the misdeeds of their English neighbours. The Government had been misled by a love of uniformity for uniformity's sake and was encroaching upon Scottish prerogatives. As the measures would greatly impair Scotland's sources of credit, they clearly violated the Treaty of Union of 1707, which stipulated that no changes should be made to the law of Scotland unless to her own evident benefit. The second letter called upon all Scottish representatives in the two Houses of Parliament to declare a legislative strike. Scott urged them to vote on no measures except when they opposed the Government. He hoped that Irish MPs would join their Scottish colleagues, as the Government scheme would create a precedent from which Ireland might in turn suffer. The first two letters, which were republished as pamphlets by Blackwood (on the March 1 and 4, 1826) had an immense impact, galvanizing Scottish national opinion. Public meetings were held throughout the country in opposition to the Government scheme. As a series of bitter attacks from the Government benches made it clear that ministers were genuinely rattled, an exultant Scott penned a third letter, published as a pamphlet on March 13. This highlighted the distress that would inevitably be caused during the transition from bank notes to coinage. Gold and silver would need to be purchased at a premium, and industries that operated at a small margin of profit would suffer. A working system and prosperous economy would be jeopardized merely to test a theory. The letters amply achieved their aim. The Government first promised that the new regulations would not be applied in Scotland for six months, then for six years, and by mid-May 1826 abandoned the scheme altogether. To this day, Walter Scott's portrait appears on Bank of Scotland banknotes in recognition of his defence of the Scottish banking system. Click on the images above to see full-size images of banknotes issued by the Bank of Scotland in 1979 and 1995 (Courtesy of the Governor and Company of the Bank of Scotland).